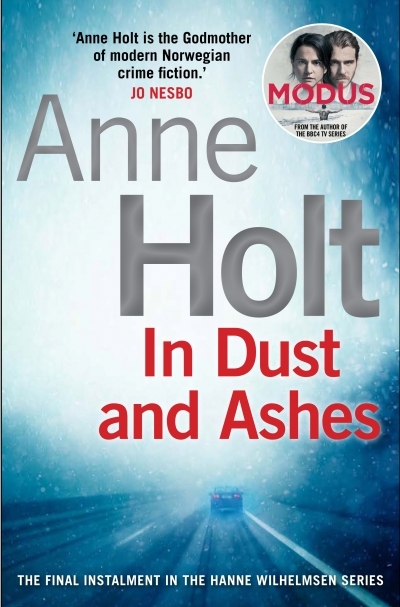 In Dust And Ashes opening line: Only a fortnight left, and then it would all be over. Maria Kvam is lazy. She expects everything to fall into her lap, and it has. Her sister was killed, leaving her a vast estate. And her wife turned it into a fortune. Now her wife has committed suicide and all she longs for is to return to her childhood home. But Detective Henrik Holme is looking into her sister’s death and Hanne Wilhelmsen is convinced Iselin didn’t take her own life. Should Maria be worried that Jonas is actually innocent of the murder of her sister? In 2001, three year old Dina is killed in a tragic car accident. Not long thereafter Dina’s mother dies under mysterious circumstances, and Dina’s father Jonas is convicted of her murder.In 2016, the cold case ends up on the desk of Detective Henrik Holme, who tries to convince his mentor Hanne Wilhelmsen that the father might have been wrongly convicted. Holme and Wilhelmsen discover that the case could be connected to the suicide of an eccentric blogger as well as the kidnapping of the grandson of a EuroJackpot millionaire. This book was a little bit slow going at first. Halfway through the novel it started picking up pace and by the end I was hooked. Even though it was easy to figure out the outcomes it was still a good read. This is the finale to the Hanne Wilhelmsen series but the book ends with a hint of more to come. An interesting review, Tandy. I spent the weekend re-writing the first few chapters of While the Buzz Bombs Fell. I also need to do a bit of internal restructuring and re-write the ending. I got some great advice on this book. If you have a moment, I would be most interested in your opinion on my new beginning. You can find it here: https://bakeandwrite.co.za/newbook-progress-with-while-the-buzz-bombs-fell/. I also received some great feedback from Dan on two of the stories for our book. I will also work on editing those over the next few weeks.